A set of 24 illustrated cards, contemplations in nature. These beautiful cards are a tool to help with readings, personal development and reflection. They come with their own guidebook, with additional contemplations in it, and a pouch so you can carry them with you. An illustrated booklet of thought provoking and empowering quotes. These are ideal as a daily focus for personal development and meditation. They also make great small gifts for friends and family. Mysterious Moon- a guided earth healing meditation. Shamanic Quest- working with power animals in a guided meditation. Diamond Light- a guided chakra healing meditation using the diamond ray. Each CD is £10 plus £1.50 p & p (UK).shortly. Mysterious Moon - An earth and personal healing meditation using the power and imagery of a stone circle. Diamond Light - A powerful ascension meditation using the diamond ray. Shamanic Quest - A medatative collection of shamanic journeys with power animals. 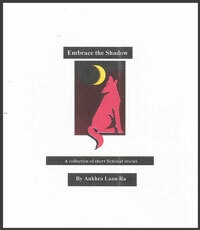 Embrace the shadow- a collection of short fictional stories available on Amazon Kindle or as a booklet from Ankhra for £2.99 or click here to connect to Amazon Kindle.